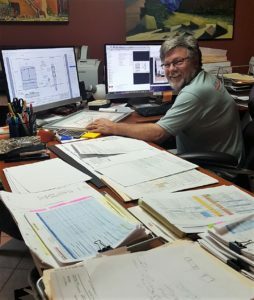 This month, we’re shining the spotlight on Jim McDonald, founder of JDM Designs. 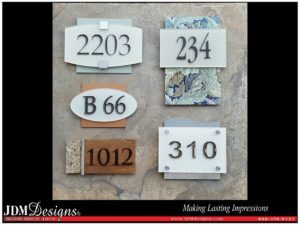 We are a full-service, custom sign company. We design and create everything in-house, and we install all over the United States. We have “Making Lasting Impressions” on our cards and brochures. We’re about building relationships. We’re a very honest company, and we’ve been doing this a long time. I’ve spent a lot of time and effort working with our teams to understand that it’s the customer that’s most important of all, and the products we create reflect their needs and accomplish their goals. Customer satisfaction, but also a cool product. We make things that are fun and exciting. Our customers like dealing with us, and they love the products. We’re imaginative. I recently received an email from one of our customers complimenting our whole team, not just me. Our whole team is accommodating, from the time you call and request a sign, through the whole design development process, to making the signs and installing them. The experience our customers receive is a good one. That’s why we have a lot of success. I’m not patting myself on the back, it’s the whole team. We’re all engaged in this whole process of providing the customers with the best they can have. What might surprise people about your company? We’re fun. Also, I don’t think people realize how much is involved in making signs — from the time you come up with a creative idea to going through all of the steps and processes. I’ve been doing this for 39 years, and so much has changed. But one thing that’s the same is the importance of the customer. We’ve had the same customers for 39 years. We have people who’ve gone on to other companies, and they call and say, “We’re over here now, and we need some signs.” I’m very grateful, very appreciative. There’s a greater power in our lives. It’s not about me; it’s about serving others. When I started in 1979, we were hand-sketching things, and we were using projectors. Of course, everything’s done on computers today, and we have all different types of machinery and tools that are really necessary — different printers, flatbed printers, rolltop printers, laser machines. We chuckle at times: We didn’t always have a boom lift. We didn’t have a Skid Steer to pick things up. We’d say, we’re just “Caveman Signs.” We were all about the hand-tooling, the hand-carving. I think there’s a lot of important value in having that experience. If we were to teach kids today how to do something the old-school way, they would appreciate and be able to use the technology today in a better way because they understand the dynamics behind the usage of the tools. Please tell us about your current role with your business. I’m the creative art director behind everything, the general manager. I also do the engineering behind the structures. Over the years I’ve really worn so many hats. One of the things that makes the company better today is I’m spreading my knowledge to the people who work for us, so they can be better at what they do. My whole day really gets consumed with communication with our team and with the customers to make sure everybody is moving in the right direction, and also with problem-solving. My attitude has changed today: At one point in my life, a problem could be a setback — now it’s exciting to me to figure out a solution. Doing something a different way can be a better option. It’s exciting to go through life knowing there will be adjustments, and those adjustments could be beneficial. What advice would you offer somebody new to your field? I go back to my first statement: It’s really all about relationships. You can get the best equipment money can buy, but in the end, it’s all going to boil down to the relationship you have with your customers — and your team. Also, don’t try to find a work-around to a problem, just get right to it. 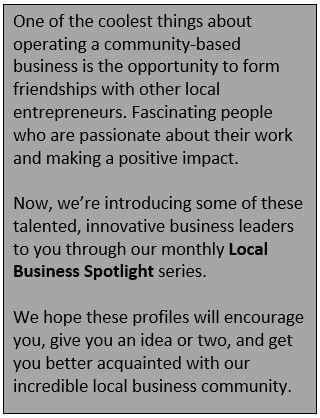 Are you involved with any community or professional organizations? We are a member of the Houston Apartment Association, the Better Business Bureau, and the United States Sign Council (USSC). The sign council is very important. They’re the ones who put on all of the awesome tradeshows and offer education and advice. Another thing that’s important is we’re an ADA-compliant certified sign company. We’re very much involved with the church community, in teaching and education. The body of Christ is probably the first priority of everything, and we talk about these things. If you need somebody to pray for you, we’ll do it. A lot of people say you can’t speak about God, but you have a choice. We’re very much a Christian company. Play guitar and sing praises to God. We have weekly Bible studies; the group keeps growing. We have all of these guitars and keyboards. Even when nobody’s there, I like to play the guitars and write songs. Again, it is about that personal relationship and glorifying the Father in Heaven and thanking Him for what’s going on. When you do that, everything falls into place. Art and music both are a big part of our lives. I paint a lot of a lot of landscapes that have been abstracted. They’re fun and full of energy and life. I like inspirational things. Some of the titles of my paintings are “Change in Motion,” “This Part of the Journey, “A New Start.” It’s not about selling the paintings, even though all artists love to sell their work. It’s about the message and sharing with others. What’s beautiful about painting and songwriting is there’s a story to tell. That’s a blessing, and we really enjoy it. Sheryl’s artwork is three-dimensional. In her own right, she’s very talented and has a great eye. Her artwork is quite well known. People who’ve bought it are all over the United States and in Canada. 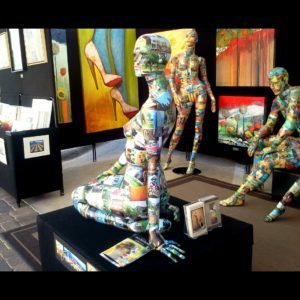 She uses a mannequin for her canvas: a photo collage on a mannequin. People commission her to do different themes. 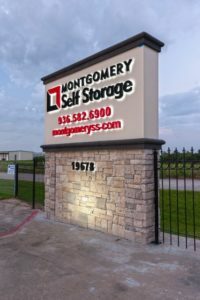 This is one of the many signs created for Montgomery Self Storage by JDM Designs. What’s the most memorable thing about collaborating with Montgomery Self Storage? It’s that connection, that bond. They’ve expressed their gratitude of professionalism to us and the fact we have our customers’ backs. For more from Jim and JDM Designs, visit them at http://www.jdmdesigns.com, and check them out on Facebook, Instagram, and LinkedIn.